where you are appreciated ! Sample box contains our authentic Shou Sugi Ban samples, usually in shiplap profile. Tom is also the director of Mercy Partners. A charitable organization that brings hope to thousands in the Sudan read more. 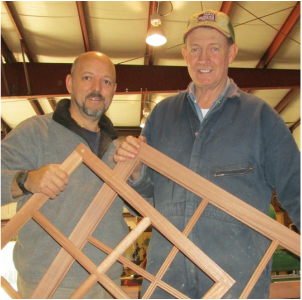 Tom Kilian, Product Designer and Woodwright, with Tim Spruill Millwright and Head of Operations holding 1800' handcrafted divided light historical windows awaiting mouth blown glass.